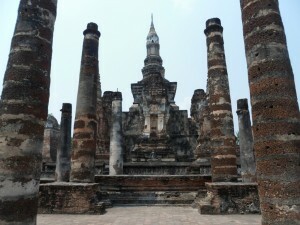 111-115 Sukhothai to Ayutthaya – Do your dream! 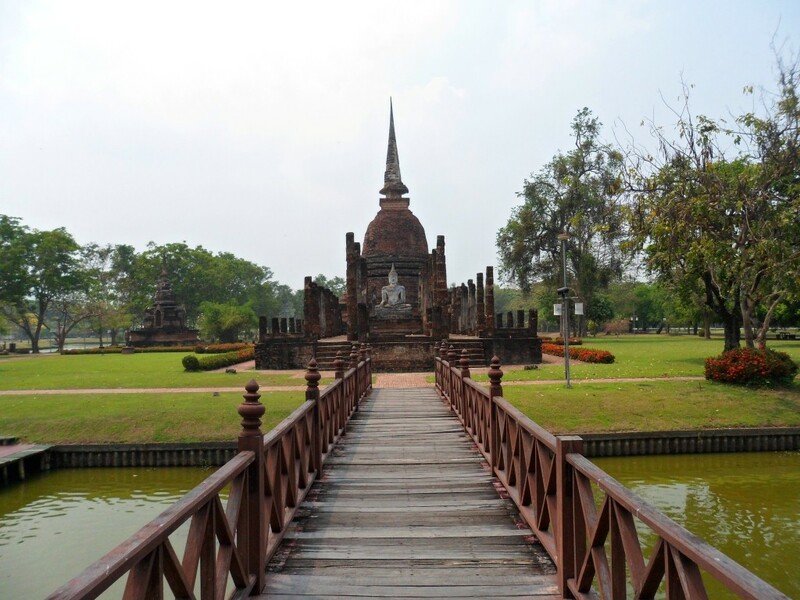 Sukhothai has a new town which in itself is nothing special, just a typical newish Thai town. Market, night market, and lots of cheapish street food. The main reason to stop here is for the historical old Sukhothai and the twin town of Si Satchanai. 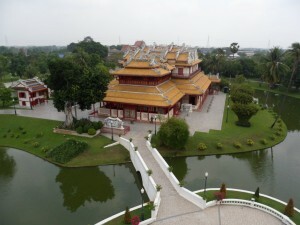 Both of which contain large ruins and historical buildings, with the former being more renovated than the latter. The old Sukhothai is very pretty indeed, nicely landscaped and some of the more renovated states and temples in nice surroundings. Really rather pleasant to walk around and have the audio guide explain a bit more about the history. It is good and worth seeing, but it doesn’t really touch Angkor park in terms of scale or wow factors. 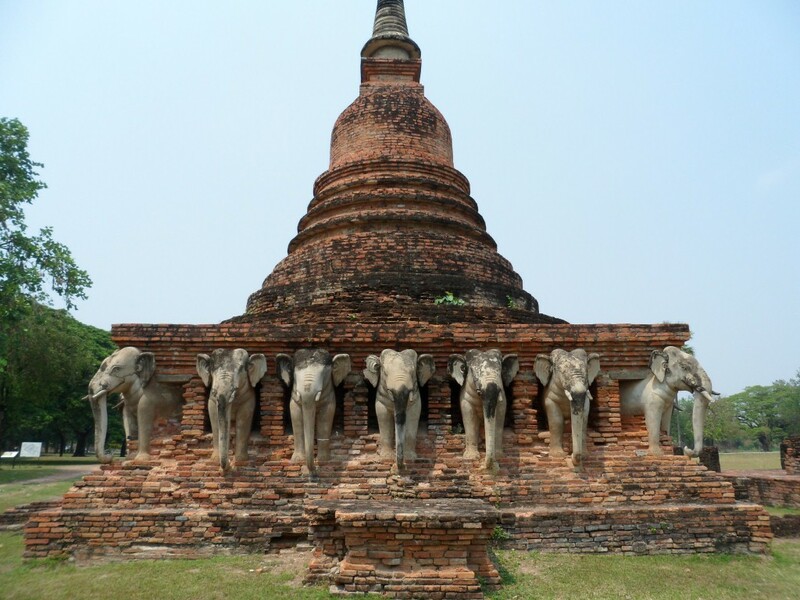 There are many Buddahs, Wats and a lovely Stupor with elephants all around the bottom but nothing fully awesome. Probably due to the bodies of water, there are more mozzies in Sukhothai at night than we’ve seen elsewhere whi ch makes open air restaurants a lot less comfortable which is a shame. We had planned to visit Si Satchanai which is similar but has not been renovated, and as such is less popular and a lot wilder and tomb-raider like. 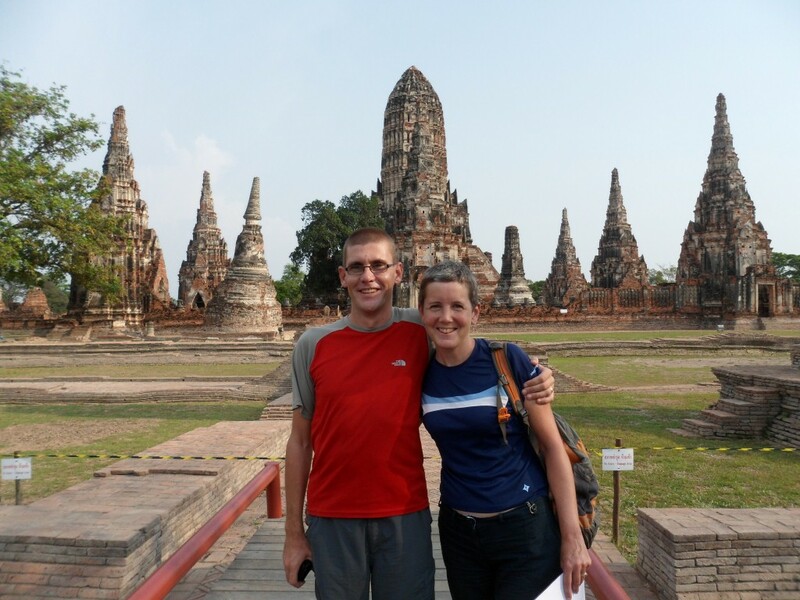 But as time is running out for us, and our next stop is Ayutthaya where there are even more ruins and old temples, we opted to skip Si Satchanai and see if we can fit a couple of days on the beach before we fly back to reality. It was supposed to be simple getting to Ayutthaya – a main bus from Sukhothai to Bangkok and just get off an hour early and grab a tuk-tuk for the last 7km. Getting of f the bus was fine but it pretty much dropped us on a motorway hard shoulder, so we just had to walk a bit till we could get where we wanted (GPS phone a perfect tool!). As luck would have it, a legitimate “motorbike taxi” stopped us and asked where we were going, but we said “not getting on your bike mate!” (in fluent Thai, obviously) – so he said “no problem, I’ll get my truck”. And in 3 mins we got in his brand new truck and taken to our hotel. So don’t think these motorbike taxi owners are poor! Our hotel is superb for the money and the hosts provide as much information as you need. It is the first place in Asia we’ve seen with a smoke alarm (albeit a cheap home one). Ayutthaya is a rather pleasant island town, and the new developments fit around the ancient buildings rather well, and many of the older temples are surrounded by good parkland. Amazingly there is no sign we’ve noticed of the flood dama ge from November which was probably a meter deep throughout the place. The photos we’ve seen are astounding, but you’d not believe it… This is the reason we’ve been going backwards for the last 4 months. We only went into some of the Wats, but Wat Ratchaburana is really quite impressive with a hidden deep staircase into tiny room filled with old paintings. Sadly deteriorated, but it must have been very special to be hidden so deep. 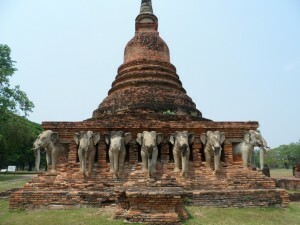 Other wats are also interesting and on par with Sukhothai. 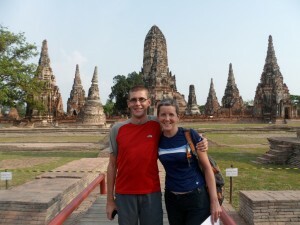 The town of Ayutthaya has a really nice feel to it – very chilled, and whist a bit touristy, no bother whatsoever. The night marked is almost entirely locals and so we took up with eating random dishes with them – not sure my chicken-foot-noodles what was I expec ted…. The following day we had a morning outing to Bang Pa-In to see the summer palace. We opted for tuktuk to station and then a 10 minute train ride. Tuktuk was 50 Bhat (£1) but train an astounding 3 bhat (6p!) each. The palace itself was interesting to walk around and look inside, and the grounds were equally a nice place to chill. There was a bizarre helter-skelter lighthouse structure sadly missing the slide, and I felt the place had an unreal feel to it – similar to Portmeirion in Wales where The Prisoner was filmed. Enjoyable for a few hours. For the afternoon we had a bo at trip on the rivers surrounding Ayutthaya to visit some more temples, complimentary from our guest house. The route went backwards to how we expected, but the first Wat was very impressive indeed. Sadly you could not wander inside due to flood damage – and it is astounding to see the flood level about 4m above the river… The second Wat was okay, but the third stop had the most impressive Buddha in it. Apparently, as it was closed when we got there. But nevertheless a fun trip ending in another street market where we got some very enjoyable food. My favourite city in Thailand, much more chilled than most and without the seedy side found in the coastal resorts. The riverside restaurants provide superb food in a fantastic setting at very reasonable prices. 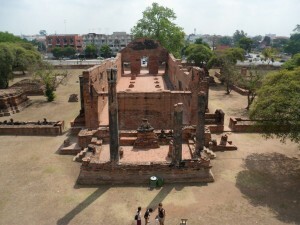 Hi, could you please tell me how did you travalled from old sukhothai to ayutthaya?